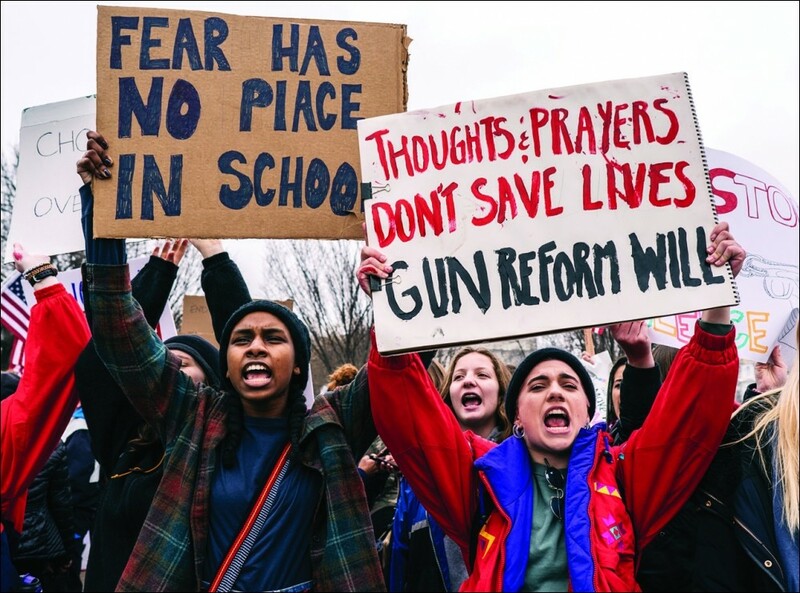 Following the shooting massacre at Marjory Stoneman Douglas High School in Parkland, Florida, on 14 February, thousands of students defied disciplinary threats and walked out of schools across the USA in solidarity with the surviving Parkland students and to demand gun control. Six Parkland survivors who had an audience with Donald Trump to demand gun control came away empty handed after the right-wing president instead suggested arming teachers. An unsurprising response for a politician whose presidential campaign was backed by the National Rifle Association (NRA). Many more walkouts will take place in the coming weeks. Stephen Edwards from Socialist Alternative (US co-thinkers of the Socialist Party) reports on this grassroots movement. The killing of 17 young people in Florida, with many more injured, is yet another massacre in a seemingly endless succession of mass shootings at schools. However, this time the survivors have stood up to the arms industry and the politicians they control and called time on their enabling of mass killings. The dam has been broken by a group of energised and furiously angry high school students, five years and 239 school shootings after the massacre at Sandy Hook. During these years politicians hired by the gun lobby have repeatedly used "thoughts and prayers" to silence any serious discussion about addressing the madness of a society awash with guns, including automatic weapons meant for the battlefield. At a 7,000-strong meeting a squirming Republican Florida Senator Marco Rubio was confronted by Parkland student Cameron Kasky, who demanded that he should decline NRA sponsorship. Inspired by the Florida students, multiple demonstrations have taken place throughout the country, including on the headquarters of the central organisation of the gun manufacturers' lobby, the NRA. A march in Chicago, called at a few days' notice, brought out about 3,000 people, mainly women, on 18 February. Calls from the platform against NRA-supported politicians, to "vote them out" were replaced on the street by "throw them out"! This is indicative of a mood in society that does not want to wait for the November mid-term congressional elections. The lead is being given by young people. Students in high school today were ten, eleven, or 12 when Sandy Hook happened in December 2012. They have grown up with active shooter drills - drills that tragically didn't save the Parkland students. Further protests are planned, including a national day of action on 20 April which is the anniversary of the Columbine school shooting (1999) as well as for a march in Washington DC on 24 March. Unions that represent teachers and other school employees should support these calls and mobilise their members to take action alongside students, including strike action where possible. The mobilisations should escalate around concrete demands including banning semi-automatic weapons and other basic gun safety measures; full funding for all school services to help students in crisis situations and demilitarisation of our communities. There are many reasons for the scale of violence but all point back to the savage history of American capitalism and the brutal alienation and inequality it engenders today. The past 40 years of neoliberal policies have seen relentless attacks on the historic gains of working people, women and black people. These attacks have been carried out under both Republican and Democratic administrations. With the profound weakening of the labour movement and the massive increase in inequality there has been a loss of the traditions of collective action and solidarity, which are vital to pushing back the dark forces tearing at our social fabric. While acknowledging that there are many legitimate reasons why people want to own a weapon in this society, including personal protection, Socialist Alternative has directly posed the question of whether the present situation is in any way in the interests of working people. The history of mass shootings is enough to show that the prevalence of guns in society is not a positive thing for the vast majority of people. But we also reject the idea that only the state can be trusted with weapons. The history of police and military interventions is one of attacks on unions and civil rights organisations, of spying, provocations and as we have seen in too many instances, the ability of the police to shoot unarmed suspects, particularly people of colour, without consequence. Peaceful political protests such as Occupy and demonstrations against corporate politics have been attacked by the police, and undemocratically infiltrated by agents provocateurs. When communities have exploded in anger against police brutality as in Ferguson and Baltimore, military equipment has been deployed that, like assault weapons, were developed for use in a war - except that as troops returning from Iraq and Afghanistan have pointed out, in a war there are clearer rules of engagement. Peaceful demonstrations have been attacked, beaten, pepper gassed and the participants pursued using legislative measures against the right to protest. The enormous number of military-style weapons that are available in the US present a clear and present danger to working class people and youth. A majority of young and working class people agree that we need reasonable limits on the type of firearms available, and also restrictions on the ability of people with a history of violence and threats of violence to have access to them. Socialists support some limitations on access to guns, and the types of guns that are available, as a public health measure. However, gun control measures will clearly not solve the problems of poverty, inequality and alienation that underlay gun violence. Measures to sharply curtail the guns already in circulation would require a massive police intervention of a kind which few would support. It is very important to see that this emerging movement of students and teachers is not only demanding restrictions on the type and availability of firearms. It is also very clearly directed against the gun lobby, specifically the NRA, the arms manufacturers and the right-wing politicians they support. The NRA is a multi-million dollar corporate lobby for an industry which, like other polluting and dangerous industries such as tobacco, asbestos, oil, coal, gas, and agro-chemicals, seeks to block legislation and prevent research into measures that might protect humans and their environment from their products in order to protect their profits. One of the NRA's standard responses to massacres like the ones in Las Vegas or at the First Baptist Church in Sutherland, is to say that the answer to "bad guys" with guns is to arm the "good guys" to the teeth. In a society where the idea of collective solidarity has been so severely undermined and where individuals feel helpless, this unfortunately has an effect. In Florida, there is now serious discussion about arming teachers in the classroom. We reject this approach which will only tend to worsen the climate of fear and violence. The students are correctly pointing to Trump and the NRA and saying, 'if you can't fix this you should get out of the way'. They are correctly pointing to the corrupting influence of corporate money. But this applies not just to the Republicans but to the Democrats as well. The Democrats and their allies will naturally seek to turn these events into a further argument that the key issue is to vote for them in November. But we need to insist that the only way to defeat Trump and the right is to build a mass movement based on a programme that speaks to the needs of ordinary people. The revolt of youth against violence and political corruption can be the spark to reignite the movement. Empower, the Women's March youth section which launched the call for a national 17 minute walkout on 14 March by students and teachers, said in a statement: "Congress must take meaningful action to keep us safe and pass federal gun reform legislation that address the public health crisis of gun violence." This is a good formulation which points further than simply gun control - it's pointing to the need for far more resources in the schools to treat people with various issues. Young people and their parents have the right to demand that they be able to go to school every day safe from the horror that visited Parkland. Young Dreamers (undocumented young migrants given the right to remain under the 2012 Obama Daca programme) have the right to be safe from deportation; young women have the right to be safe from sexual assault; young black people have the right to be safe from police brutality. Through collective, mass struggle we can bring down the Trump regime and win real reforms. But we will need to go further and root out the capitalist system that keeps breeding horror upon horror.